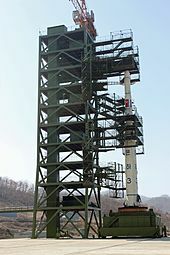 Unha-3 space launch vehicle at Sohae Satellite Launching Station in North Korea. The United States remains headed for a military confrontation with North Korea, as rhetoric on both sides continues to escalate. Criticism has been leveled against the new American President, that his bombastic tone, is intensifying the hostility between the two countries. In truth, the present crisis is the result of a failure in American foreign policy, towards preventing a nuclear breakout by North Korea. The military threats emanating from North Korea, is increasing the insecurity in East Asia. After two missiles flew over Japanese territory earlier this year, the government there was finally prompted to buy American made long range missiles, for the first time ever. Earlier this month the fear of war ratcheted up even further, when for 38 minutes, people in Hawaii through their cell phones, were told that the islands were the target of inbound missiles. The decision by North Korea to accelerate its nuclear weapons program, was made in the early 1990’s. It occurred against the backdrop, of a relaxation in international relations. The Soviet Union had collapsed and China had just decided, to recognize the government in South Korea. 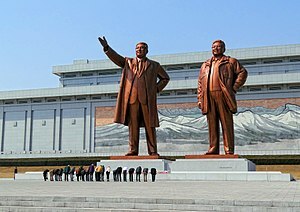 North Koreans bowing in front of the statues of Kim Il-sung (left) and Kim Jong-il at the Mansudae Grand Monument. These developments made the North Korean government, under the control of the same man since 1948, feel increasingly anxious. The ending of the Cold War was a direct threat to the regime, because communism was now under attack, in various parts of the world. As one regime after another imploded in Eastern Europe, where long time communist dictators, were either forced to resign or were overthrown, the founder of North Korea found himself increasingly isolated diplomatically. Kin II-sung died in the midst of a standoff with the United States, over the development of nuclear weapons. 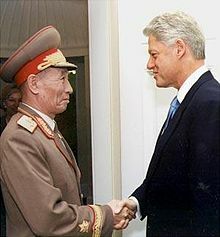 North Korean Vice Marshal Jo Myong-rok meets President Bill Clinton at the White House, October 2000. 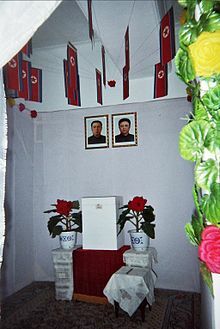 Upon his death in 1994, power then passed to his son, Kim Jong-il. That same year, the Agreed Framework was negotiated and signed by the Democratic President Clinton from the United States. The latter had been elected President in 1992, following his electoral victory, over the former Republican President George H. Bush. The objective of the agreement was the freezing of the North Korean nuclear program. It was supposed to lead to a denuclearization of the Korean peninsula. It was also an initial peace agreement, between the governments of North Korea and the United States. It was signed in the wake of North Korea’s advance notification, of its intended withdrawal from the Nuclear Non-Proliferation Treaty. The North Koreans suspended it after 89 days, just one day short of the required notice of intent. At the same time the United States was continuing to build up its military strength in the region and was actually considering, the bombing of the active Yongbyon nuclear reactor. The 5 MWe pilot Yongbyon nuclear reactor, made operational in 1986, showing the fuel access channels. The Agreed Framework was never submitted to the United States Senate for approval, so it cannot be considered an actual treaty. It was neither a legally binding executive agreement. It was instead a non-binding political commitment between North Korea and the United States, submitted to the United Nations Security Council. Although one can discuss the various merits and deficiencies of the agreement, three developments are mostly agreed upon. The first was suspension of the withdrawal of North Korea, from the Nuclear Non-Proliferation Treaty. 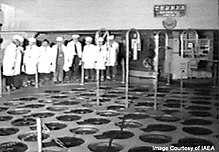 The second was the abandonment of a number of nuclear reactors either in use or under construction, that could be used to produce weapons grade plutonium. Kim Jong-il talking with Russian President Vladimir Putin during their 2001 meeting in Moscow. The third and most important long term result, was that the North Koreans proceeded to build an uranium enrichment facility. This was done in violation of the 1992 Joint Declaration, which was for the complete denuclearization of the Korean Peninsula. It has been reported that officials under the Clinton administration, may well have agreed to the loose terms of the deal, only because they believed that the North Korean regime would soon collapse. At the same time North Korean officials suspected that the United States was anticipating an early demise of the government, since Kim II-sung had just recently died. In the 1994 elections, the Republican Party regained control of the Congress. The party as a whole, did not support the Agreed Framework. Many of them looked upon the deal, as a policy of appeasement. The lack of Congressional support, obviously weakened the agreement. Although the Congress would later agree to provide partial funding for the promised 500,000 tons of heavy fuel shipments to North Korea, the amounts allocated were often often insufficient. This of course led to late deliveries, which may have contributed to the souring of any long term enthusiasm, by the North Koreans for the Agreed Framework. It is likely Kim Jong-il agreed to nuclear freeze, primarily because the Clinton Administration had agreed to phase out American economic sanctions, that had been in place since the Korean War. Once again, congressional opposition to the lifting of sanctions, made that presidential commitment largely unattainable. International funding for the two light water reactors (LWR) promised to North Korea,as part of the agreement, had to be sought out. The Republican controlled Congress was largely unwilling to contribute to the project. In addition to financial support issues,there were numerous delays in the approval and building process,further angering the Kim Jong-il regime. By 1998, North Korea was warning that it would restart its nuclear research program, if the LWR plants promised, were not soon installed by the United States. Although formal ground breaking had occurred already in 1997, significant spending on the project would not commence until 2000. It was an election year in the United States, and President Clinton had now run out of time, to fulfill the commitments he made to the North Korea government. Administration officials had disingenuously testified in 1998 to the Congress, that the North Koreans were abiding by the Framework Agreement. Even though the State Department knew at the time, that Kim Jong-il’s government, was cheating on the highly enriched uranium aspect. Robert Gallucci the chief American negotiator of the agreement, warned the whole edifice would collapse, if the United States did not fulfill its agreed upon obligations. 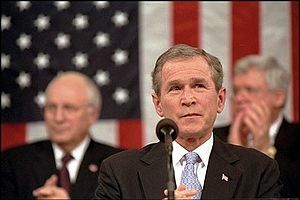 2002 State of the Union Address when President Bush identified the Axis of Evil. President George W. Bush took office in early 2001. By the following year, he was labeling North Korea as part of an Axis of Evil, along with Iran and Iraq. Later in 2002, an American delegation confronted the North Koreans, about their uranium enrichment program. Although the two governments have different accounts of what actually occurred, relations between North Korea and the United States would rapidly deteriorate. Furthermore, KEDO (Korean Peninsula Energy Development Organization) tasked with the construction of the two reactors, was now far behind schedule. The original date for completion had been for 2003, but the project had been put on hold, already in late 2002. Complicating matters, a number of Senators accused the Clinton Administration, of seriously underestimated the cost of the project. KEDO would cease work on the reactors, by the end of 2003 and would terminate the whole undertaking in 2006. There is still some controversy how advanced the North Korean uranium enrichment program was, in the early 21st century. What is indisputable, is that there were not being fully forthcoming, about their nuclear program. Oil shipments had already ceased in December 2002. The following month, North Korea announced its withdrawal from the Nuclear Non-Proliferation Treaty. In early 2005, North Korea made it known, that it now had in its possession, manufactured nuclear weapons. They declared it was a nuclear deterrent, for self-defense only. The North Korean capital of Pyongyang in 1989. The following year in October, the regime conducted a nuclear test. At this time American intelligence agencies believed it was now likely, that North Korea had produced a number of simple atomic weapons. Although the Agreed Framework had mostly broken down, North Korea did not restart work on the two production size nuclear power plants, that were frozen under the agreement. These two facilities together, could of potentially produced enough plutonium of weapons grade quality,for several bombs annually. In addition, the Agreed Framework did stop plutonium production at Yongbyon for eight years. However, in the end, it totally failed to prevent a concealed highly enriched uranium program conducted by North Korea. 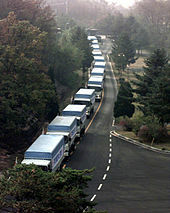 South Korean aid convoy entering North Korea through the Demilitarized Zone, 1998. Discussions would now take place through the Six-party talks, in an attempt to negotiate a replacement nuclear agreement. Along with North Korea, the nations of South Korea, Japan, China, Russia and the United States collectively, sought a new type of accord. In September of 2005, a preliminary understanding was reached. No mention was made of the fact, the United States had the contention that North Korea had a secret, underground enrichment program. The new accord did require North Korea, to dismantle all nuclear facilities, not just specific plants as was the case under the former Agreed Framework. The aim of the Six Party Talks, was to somehow find a peaceful resolution, to the security concerns that had arisen as a result of the expanding North Korean nuclear program. Five rounds of talks from 2005 to 2007 produced very little progress, until the third phase of the fifth round. It was then that North Korea finally agreed, to shut down its nuclear facilities in exchange for fuel aid. A further condition was that both Japan and the United States, would take steps to normalize relations with North Korea. Despite the endless discussions and negotiations, the goal of a nuclear free Korea would remain elusive. In the finality, North Korea would once again, back out of giving up its weapons program. Despite the far harder line towards North Korea, in the end the Bush Administration, like the one before it, failed to forestall the ongoing development of the nuclear and missile projects. Perhaps, too much energy and political capital had been invested in the Middle East, following the terrorist attacks on American soil. Invasions by the United States of Afghanistan in 2002 and later Iraq in 2003, consumed most of the first and second terms of President Bush. Bush would leave office in early 2009, with the issue of a nuclear North Korea still unresolved. The problem would now fall into the hands, of the newly inaugurated President Obama. 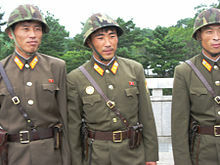 Korean People’s Army (KPA) soldiers at Panmunjom. In April of that year, the United Nations Security Council would condemn the North Korean launch of a satellite, despite its failure. As a result of actions taken at the United Nations, the Six Party Talks would be discontinued the same year, when the North Korean government angrily announced the end to them. North Korea then decided to resume its nuclear enrichment program, which would subsequently, boost the country’s military deterrent to attack. As a further demonstration of new resolve, all nuclear inspectors would subsequently be expelled from the country. In May of 2009, North Korea made the further decision, to detonate a nuclear device underground. The test was widely condemned internationally. 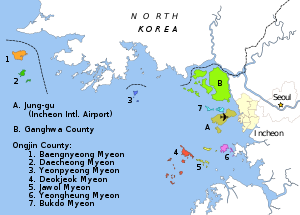 In November of the same year, the Battle of Daecheong occurred. Ships from North and South Korea would exchange fire. The North reportedly sustained heavy casualties, while the South emerged virtually unharmed. 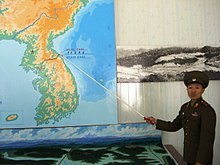 There followed an escalation of hostilities between the North and South Korea in both 2010 and 2011. The South Korean patrol vessel Cheonan-Ham was sank by a North Korean torpedo, launched from a submarine in 2010. This was established by an international team of experts, that came from Australia, Canada, South Korea, Sweden, the United Kingdom and the United States. 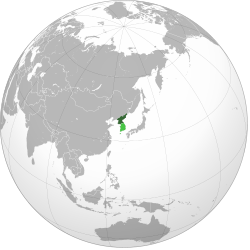 Later the same year, North Korea would shell Yeonpyeong island, which was part of South Korea. Two South Korean soldiers would be killed and a dozen injured. Civilians would flee the barrage and some 60 houses, were set ablaze from the attack. Photo-realistic sketch of Kim Jong-un. In 2011, there was a change in leadership in North Korea. 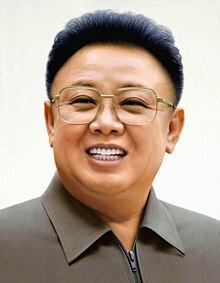 Kim Jong-il would be succeeded by his son, Kim Jong-un. The former had passed away earlier in the year. On February 29th 2012, in what has become known as the Leap Day Agreement, the United States agreed to provide substantial food aid, in return for a moratorium by North Korea on uranium enrichment and missile testing. There would also be a return of the international inspectors to Yongbyon, followed by a resumption of the Six Party Talks. The following month in celebration of the 100th birthday of the late Kim il-Sung, the North Koreans announced they were launching a new satellite. The other 5 members of the Six Party Talks condemned the declaration, leaving further dialogue among the participants in doubt. In April, the satellite launch failed to achieve orbit. The operation was declared to be a failure by both South Korea and the United States. 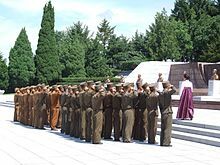 North Korean soldiers saluting at the Revolutionary Martyrs’ Cemetery in Pyongyang, 2012. As a test of missile technology, the launch was still seen as a provocative move by the United States. It subsequently forced the embarrassed Obama Administration, to suspend any further food aid to North Korea. President Obama who was running for a second term in 2012, secretly sent officials to North Korea, in an effort to minimize disruptions to the United States presidential election. In December of 2012, North Korea was able to successfully launch a missile, in contrast to the earlier failure. The United States once again condemned the action,believing the North Koreans were developing long range ballistic missiles, that would be able to reach the west coast of the United States. 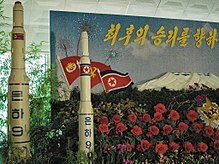 Model of a Unha-9 rocket on display at a floral exhibition in Pyongyang North Korea, August 30, 2013. 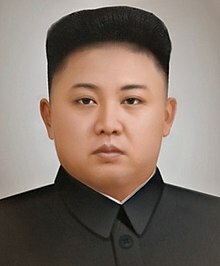 The following year beginning in early 2013, Kim Jong-un would threaten the United States itself by stating that “ rockets were ready to be fired at American bases in the Pacific“. It was supposedly in response, to the two B2 stealth bombers, that flew over the Korean peninsula the day before. It was at this time, that the United States still had the ability and now the justification, to eliminate the North Korean nuclear threat, with a minimum of risk to American assets. It would of required a massive and overwhelming attack, before the North Koreans would be able to use conventional weapons to destroy, the South Korean capital of Seoul. No doubt some military strategists argued against it, concerned over what China and possibly Russia would do, in the face of an overpowering American assault. People in Pyongyang watch Kim Jong-un on North Korean TV, 2015. Instead of preparing for war, the Obama Administration readied for a long standoff. After Jong-un’s threat, the American military did call for an advance missile defense system to the western Pacific. Although the United States Secretary of Defense, Chuck Hagel stated that North Korea posed a “ real and present danger“ to not only to the United States, but Japan and South Korea as well, nothing more was done. Portraits of Kim Jong-un’s father and grandfather (Arirang Festival mass games in Pyongyang). Later in the month, John Kerry the Secretary of State for the United States, made a number of comments that proved again to be empty in their promise. He said that “ North Korea will not be accepted as a nuclear power“ and that a missile launch by North Korea would be a “ huge mistake“ . North Korea would now issue conditions, for which any talks would take place with South Korea or the United States. These would include lifting the United Nations sanctions and an end to all South Korean and United States military exercises. In 2013, and 2014 several American citizens would be arrested and detained. 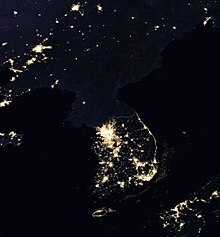 Satellite image of the Korean Peninsula at night, showing North Korea in almost complete darkness, with one small bright spot, the capital Pyongyang. In early 2014, it was announced on Twitter, by the official Chinese news agency, that the North Korean ambassador to China had agreed to a resumption of the Six Party Talks. They also called on the United States to fulfill its earlier obligations. Nothing came of the initiative. In July, the Republican controlled United States House of Representatives, voted to pass the North Korean Sanctions Enforcement Act of 2013, but it failed to pass the Democratic controlled Senate. By January of 2015, President Obama was indicating that he believed over time, the North Korean government would collapse. It was the same wrongheaded notion that was shared by President Clinton and his advisers in the 1990’s. The North Korean regime will undoubtedly survive, as long as either China or Russia wish it. In the middle of 2016, a North Korean diplomat for American affairs was claiming that the United States had crossed a “ red line“ for putting Kim Jong-un on its list of sanctioned individuals. The North Koreans insisted, this was tantamount to declaring war. The North Korean government had correctly ascertained years before, that the Obama Administration would not do anything, to prevent them from moving forward with their nuclear program. They would periodically make strong statements, but do little else. The newly installed Trump Administration, is now facing very difficult choices. The North Koreans had pushed forward with their nuclear and missile program, during the eight years of the previous administration. Last year, United States Defense Intelligence Agency suggested that North Korea had indeed, developed nuclear warheads for missiles, within reach of the American mainland. In August of 2017, President Trump stated that if necessary the United States would wage a war of “ fire and fury“ against North Korea, if they failed to cease nuclear testing. As expected, the North Korean government retaliated by issuing a series of threats against the American territory of Guam, Japan and South Korea. In a speech to the United Nations General Assembly the following month, the American President threatened to “ totally destroy“ North Korea if the United States were “ forced to defend itself or its allies“. What critics of the present policy in the United States choose to ignore, is the fact the philosophy of strategic patience advocated by the previous administration, has utterly failed. Indeed, it provided the time needed for North Korea to develop its weapons program, to the point it now can realistically threaten neighboring countries. The Trump Administration is willing to give stepped up sanctions, one more try. His cabinet correctly sees these new international sanctions, put in place by the United Nations, as a last ditch effort to prevent war. Again it is dependent on the Chinese and Russians, to keep their commitments, in regards to further isolating the North Korean regime. Without energy imports, the North Korean regime would be forced to either negotiate a diplomatic truce or watch their domestic economy head for collapse. The evidence so far shows ongoing clandestine efforts by both China and Russia, to go around the new international sanctions. If sanctions fail now, war is inevitable. It is not yet clear, if the North Korean regime has adapted to the reality that the Trump Administration does not intend to live indefinitely, under a nuclear threat from North Korea. The year 2018 is likely to be the year, where a solution to the intractable problem of a nuclear armed North Korea, will finally be solved, one way or another.